Second, wages growth and inflation are likely to remain low as growth is unlikely to be strong enough to eat into significant spare capacity in the Australian economy. 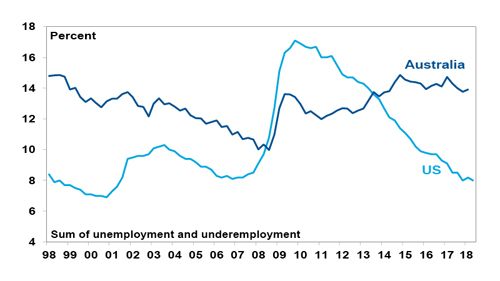 Some say Australian rates just follow those in the US but there has been a big pergence in recent years. 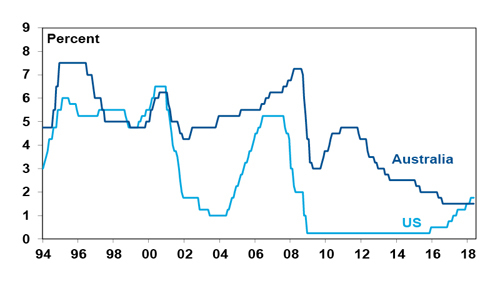 In 2009 while the Fed left rates near zero the RBA started raising rates only to start cutting them from 2011. And while the Fed started hiking rates in 2015 we continued cutting them in 2016. Finally, house prices are slowing led by falling prices in Sydney and Melbourne with more weakness likely. APRA measures to constrain investor and interest only borrowers have worked. These measures, combined with poor affordability, rising unit supply, falling expectations for price growth and the end of FOMO (fear of missing out) are pushing prices down. The latest round of tighter lending standards will add to this, as will any move to lower immigration levels (and curtail negative gearing and the capital gains tax discount were there to be change in government). There are two main pressures at present. The first is a rise in money market funding costs in the US and Australia of around 0.3 to 0.4%. Given that only 10-15% of bank funding comes from this source it's unlikely to have much impact. 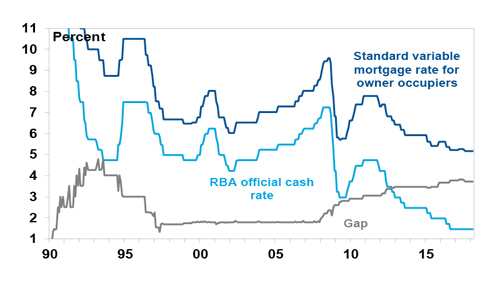 And the banks are unlikely to pass on the extra costs to owner occupiers on traditional loans given the Royal Commission, but banks could raise rates for investors and interest only borrowers. Higher US bond yields could also place some pressure on bank funding costs but again this is likely to be modest, and probably unlikely to result in higher rates for owner occupiers on traditional loans. The main thing for traditional borrowers to watch is the cash rate. If we are right, such borrowers will see pretty stable mortgage rates out to 2020. 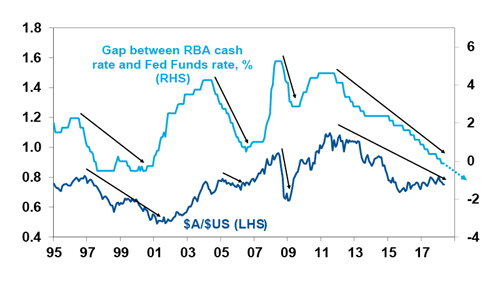 With the RBA likely on hold and the Fed set to keep hiking, the interest rate gap between Australia and the US will go further into negative territory. Historically, this means a fall in the value of the Australian dollar. The $A appears to be starting to break below the rising trend channel that’s been in place since 2015 and we see more downside to around $US0.70. A fall to below $US0.50 as we saw in 2001 is unlikely as commodity prices are likely to remain much stronger than they were then. Second, as a result assets that are well persified and provide decent income flow remain worthy of consideration. This includes unlisted commercial property and infrastructure along with Australian shares which continue to offer much higher income yields compared to bank deposits.